A unique mixed-use development in West Chelsea may be the paradigm of what new development in Manhattan could aspire to. 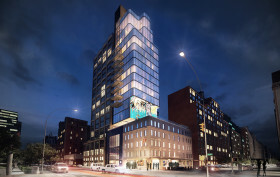 Combining new construction and rehabilitation, and marrying ostentatious high-end condos with affordable rentals and an art museum/gallery, the project dubbed Chelsea SkyBox will satiate a wide spectrum of urbanites. The 250-foot tower will rise directly south of Annabelle Selldorf’s metal-face condo 200 Eleventh Avenue (aka the “Sky garage”) and will host ten full-floor apartments plus a spectacular five-story penthouse that developer Jonathan Leitersdorf told the Journal he will ultimately occupy. The project also will rehabilitate the corner SRO building next door known as the Chelsea Highline Hotel. The ground floors of both buildings will be shared, and there will be 15,000-square- feet of commercial space that will have 30-foot-high ceilings and accommodate an art museum and a private gallery to contain works by Picasso, Keith Haring, Kandinsky, and Anish Kapoor.